Engines serviced July 2018. Engines stripped back and rebuilt 2010 with receipts by Prestige Engine Products, bench tested, and issued with manufacturer certificates. Only 210 hours since rebuild. Gearboxes replaced too. Yanmar Generator, Stern and Bow Thrusters which can be controlled at both helm positions. Hull Anti-fouled November 2018. Fuel Tanks can be linked, swapped or independent. Holding tank with diverter valves allowing for dockside pump out or at sea. The accommodation is bright and airy and of good proportions providing exceptionally comfortable seating too. She looks and smells lovely. Navigational Gear Updated - £2,000 spent. This Fairline 41 Sedan is one of the best examples that I have seen and appears to be turn key - the surveyor who last surveyed her was of the same opinion. She looks wonderful for her age, the engines start on the button and sound sweet. Stern and Bow thrusters make her so easy to handle. Modern Navigational gear (2,000 spent in last year). 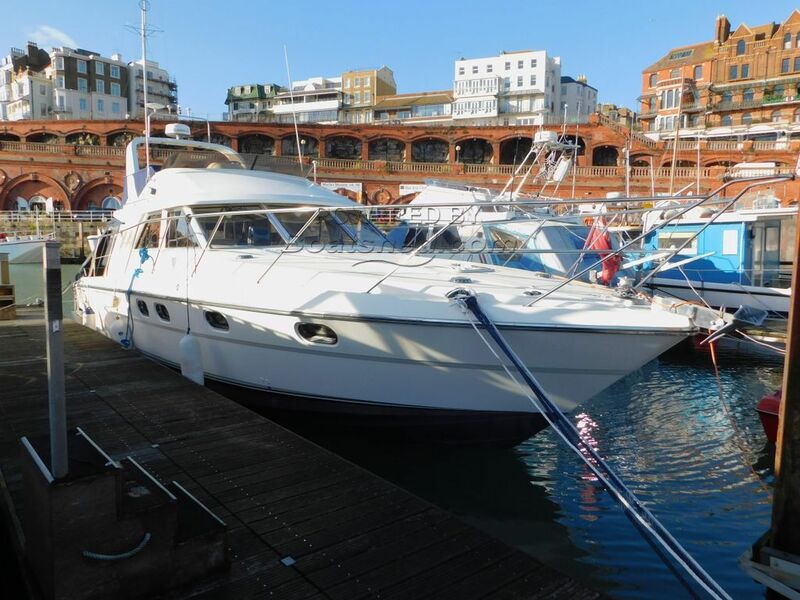 The owner has recently motored her around to her current mooring so that answers the question as to whether the engines perform, This boat has a fabulous pedigree and she offers excellent accommodation as well and is suited to couples and families alike. If you are looking specifically for one of these then I think the first to view will buy. This Fairline 41/43 Sedan Flybridge has been personally photographed and viewed by Suzzanne McDonald of Boatshed Kent. Click here for contact details.